Paul “Whitey” Kapsalis and his siblings were introduced to soccer while living in St. Louis. The entire family loved it. Whitey’s father, Andy, worked for Allstate Insurance and was relocated to Minnesota where youth soccer didn’t exist, so the Kapsalis family started one. This club has since exploded in growth. The next stop was in Michigan. There, they started the Bonanza Express Soccer league, which was a select travel team, for his parents had a vision as to what the youth soccer landscape would become. His oldest brother Pete played soccer for Michigan State University. While Pete was at MSU, the Kapsalis family moved to Carmel in 1981. Danny, the second of five, was a senior and Whitey was a sophomore. Soccer was not yet a varsity sport at the high school, and it was Whitey’s mom, Becky, who led the charge to petition and get soccer accepted as a varsity sport at Carmel High School. Ultimately, the IHSAA adopted it. 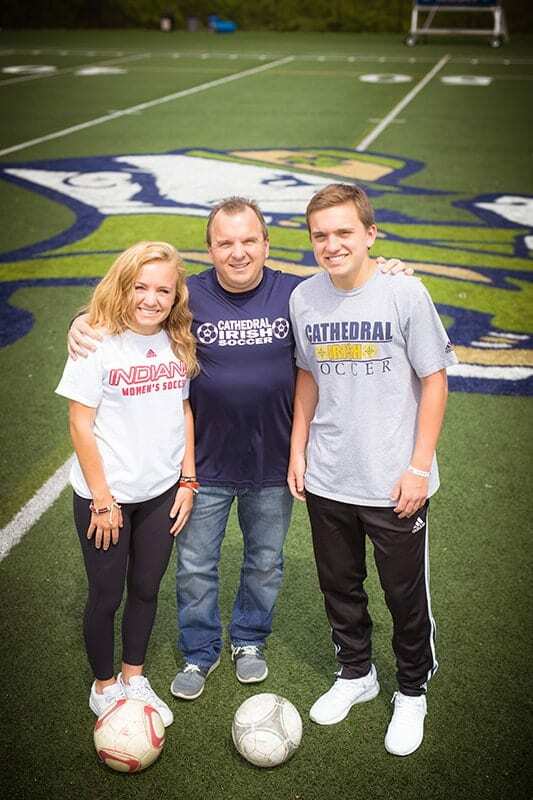 While living in Carmel, the Kapsalis family would road trip to Chicago to buy their soccer gear. Becky was inspired to open a soccer store in Carmel, and 25 years later, it was voted the No. 1 soccer store in the U.S.
Danny graduated from Carmel High School, where he set school records for scoring and walked on at Indiana University, the best soccer program in the country. Whitey gave a verbal commitment to play at Michigan State. Then, Danny won a National title at IU, and Whitey turned his attention to Bloomington. Whitey called the IU coach to talk about playing there. It made sense to go to Michigan State when Whitey assessed the pros and cons on paper, but the intangible element of having a dream was a challenge to transcend by a mere pen. After a three-hour conversation with his parents discussing why he was making this decision, it ultimately came to down to one question. Whitey placed a call to Coach Joe Baum at Michigan State and told him the news. Baum was gracious in receiving this call. Then he called Coach Jerry Yeagley and informed him that he was coming. Once on campus, Whitey attended and watched all of the practices, working out on his own until the tryouts. He started doing the math and every factor weighed against him. Whitey was a long shot, but he worked his tail off and made the cut. He was the only player selected as a walk-on from tryouts. Even though he was red shirted his freshman year, Whitey was over the moon that he was a part of the program. They won another National Championship that year. The recent recipient of the National Association of Women Business Owner’s (NAWBO) 2016 Woman Business Owner of the Year, Jeryl Mitsch started her business with determination and sheer will more than 25 years ago. Growing up in Traverse City in northern Michigan, Brian McCutcheon’s first sculptural experience was fixing up his first car. “In retrospect, I realize my uncle lives like an artist. He was always in his shop where he has built hundreds of cars,” says Brian, who describes cars as a form of sculpture. Avon residents Will and Adrienne Pfaffenberger began their journey into parenthood through the traditional route and then weighed fertility options, eventually deciding on adoption as their best course of action to become parents.